I was born in Himeji City in western Japan, but my family has never lived there. In Japan, there is a custom called satogaeri (literally, “returning to one’s home-place), which allows expecting mothers to return to their natal households to give birth with the help of their own mothers, not mothers-in-law. My mother was in Himeji for a month after my birth and then returned to the Metropolitan Osaka area (2nd largest city in Japan), where I grew up. While my mother was from a wealthy family of land-owning farmers, my father was a son of tenant farmers who migrated to Manchuria (northeast part of China that the Imperial Japan occupied before the WWII) as colonists for a better future. When Japan lost the war in 1945, my paternal grandparents returned to Japan on a ship, which arrived near the Suma beach in Kobe City. My father named me after this place. Toward the end of high school, I became really interested in the question of culture. Why do different societies produce different ways of thinking and ways of life? The one-year high school exchange program in rural Thailand ignited my curiosity in this area. For instance, my class of roughly 40 Thai students had 3 kathoeys (gender category in Thailand that includes effeminate gay males). I was surprised and then intrigued about cultural categories. Around the same time, I was also developing an interest in minority issues in Japan, so I chose to attend Hokkaido University, which is known for its research on indigenous people of northern Japan called the Ainu. I majored in Anthropology and History there. I was really interested in how different cultural systems and historical forces create different realities, experiences, social orders, etc. One of my favorite professors at my undergraduate university in Japan was a scholar of religion and expert of Durkheim. In his class, we’d read The Elementary Forms of the Religious Life in English (not in French because few of us undergrads were that good at French!) word by word. I don’t think I’ve done that kind of close reading since then. He also had this sarcastic sense of humor that I loved. Then, as I worked toward my master’s at Brandeis University in MA and then Ph.D. at Emory University in GA, both in Anthropology, I deepened my interest in the study of religion as a cultural phenomenon. Whenever I compared cultural systems in my ethnographic projects (U.S. and Japan for M.A. and Japan and Brazil for Ph.D.), the category of religion popped up in my data as a primary mechanism of difference-making. It’s been an interesting journey, because now I work in a department of religious studies! I worked at the 2005 Special Olympics World Winter Games in Nagano, Japan, as an English-Japanese interpreter. It was funny, because I ended up using my intermediate French much more frequently than my English. My “post” was near a team from France and they wanted to speak to me constantly. Too bad that I mostly forgot French since then (and Thai too for that matter). It seems my brain can hold only 3 languages at any given time and currently they are English, Japanese, and Portuguese. When I started my doctoral training, I set out to research minority groups and their health issues in Japan. So I decided to visit Brazilian migrant communities one summer to see what’s going on. They are among the newest foreign migrant groups in the country because the large-scale Brazilian migration to Japan started only in 1990. That year, the Japanese government introduced a new visa for foreigners of Japanese descent up to the 3rd generation. So the majority of Brazilians in Japan today are Japanese descendants. I started my research expecting some psychological issues, given their marginal and ambiguous place in a society that values ethnic homogeneity. As it turned out, I encountered so many Pentecostal Christians and found so many charismatic churches in the migrant communities that I had to change my research plan. Now I’d say my specialty is identity negotiation at the intersection of transnational migration and the globalization of religion. Sometimes you don’t get to control what you study, I suppose. I have just finished revising an article for Ethos: Journal of Psychological Anthropology. The title is “Accompanied Self: Debating Pentecostal Individual and Japanese Relational Selves in Transnational Japan.” Yes it’s a mouthful, but reality is complex sometimes… It’s coming out in the spring of 2017. Now I am working on a book manuscript entitled Japanese Blood, Brazilian Birth, and Transnational God: Diasporic Return and Global Pentecostalism in Japan. It analyzes why Japanese Brazilians convert to Latin American Pentecostalism in their ancestral homeland, where Buddhist and Shinto traditions predominate. I am also slowly working through the video footages from my yearlong fieldwork among Japanese Brazilian migrants to produce ethnographic films. I am hoping that these digital resources can accompany the book to enrich the reader/watcher’s learning experience. I love throwing pots. Most of the plates and mugs at my home are things I have made in the past five years. Since I am still new to Tuscaloosa, right now I’m looking for a studio where I can continue throwing. I also love hiking on trails and have just been to the Lake Lurleen State Park with my husband this past weekend. I hope to go to many more trails around Tuscaloosa and in Alabama. 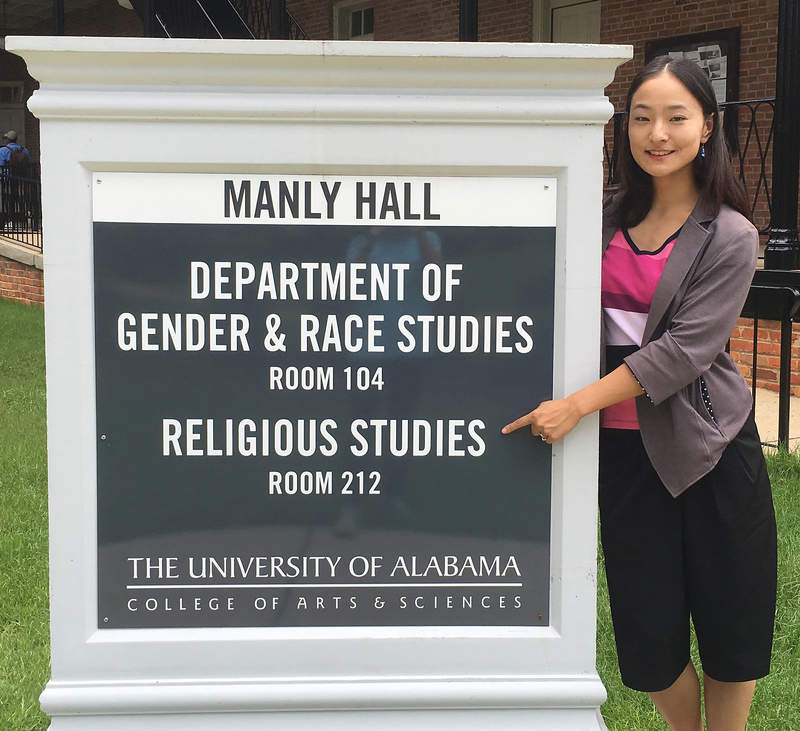 This entry was posted in Faculty Blog, Relevance of Humanities, Religion in Culture and tagged anthropology, Backstory, Brazil, Durkheim, Faculty, Japan, research, Suma Ikeuchi by admin. Bookmark the permalink.